Discussion in 'Android Forum' started by restorer, Mar 7, 2018. I can‘t add a contact to my phone. The manual says go to contacts, touch the icon to add a contact, but a message “You have disabled a required permission” comes up. 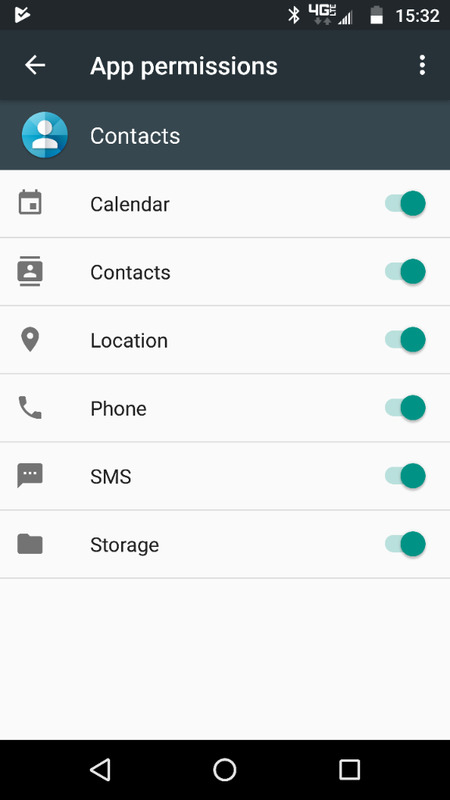 go to the app list in settings, scroll down to find the contact app and change the permissions there. I tried changing some things, and it said "If you deny this permission basic features of your device may no longer function as intended"
When you go to Settings > Apps > Contacts > Permissions what does it look like on your phone? Here is an example from my phone. Where are you trying to save them to? The SIM card, Local Contact, or Google Contact? When you open your Contact app > Menu > Contacts To Display what option is selected? Phone, SIM, Google, etc? I have always used the Google option, that way all Contacts sync with my GMail Account and are visible on any computer I log into, my tablet, and any new phone I activate. Never have to try and "move" them or "transfer" them. Just trying to help understand why your phone won't let you add a new Contact & where it is trying to save that new information. Home app, Browser app, Phone app, SMS app I have a Google account, how do I add it to contacts? I appreciate your help. This is my first cellphone. I am only 80 years old, but you can call me slow if you want to. No one will call you slow, or any names around here. We all started with our first smart phone at some point in time, and had to learn. When you open Contacts and select the menu option is there a Settings or Accounts option? You have to select your Google account as the primary display and save new contact option first. Then you can try to add a new Contact to your Google account. Solved- I added a contact to my Google account using the computer. The cellphone I have is a replacement. It is a newer model. The old phone was easy to add a contact and they are in Google. I’ll learn to use this new phone. I really appreciate your trying to help me. Glad to hear you got things working better.